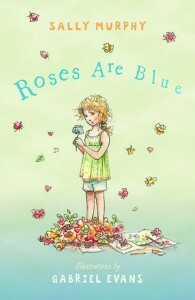 It’s due for release on July 1, though it will be launched a little earlier, at the CBCA Conference in Canberra in May. It’s a lovely time of year in my part of the world. Autumn seems to be always mild here, and this year it’s been glorious (though I am aware that we really do need some rain). As a result my morning walks and bike rides are special, filled with bits of magic. 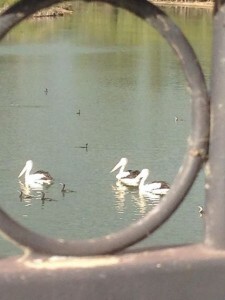 Most magic this week has been the presence of three pelicans on my local lake. It’s not a big lake, but always has plenty of ducks, an occasional swan, ibises, and even spoonbills. But I’ve never seen a pelican there – let alone three of them. The light that morning added to the magic. Reminded me more than a little of looking through the round window on Playschool. 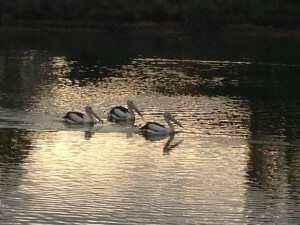 A day that starts with a pelican (or three) is bound to be a good day. Okay, so maybe frogs in reeds is not unexpected. What is unexpected is that these reeds are next to a bridge on a busy road. You can’t see them unless someone tells you they’re there because you have to stand on a retaining wall and peer over the bridge railings to see them – hundreds of frogs colonising reeds at the edge of a little lake. I like to think they are secret frogs, there just for my enjoyment, after Murphlet 2 discovered them and told me about them. The theme for this week’s 52-week Illustration Challenge is trees. I found this one a little easier than last week, but took a while to figure out how to present it. Hope you like the finished product. The theme for this week’s 52-week Illustration Challenge is cross-hatching. I really struggled with this because, while this is supposed to be an illustration challenge, I’m participating by writing a poem on each week’s topic – a picture in words, if you will. But cross-hatching is a specific illustrative technique, and hence not so easy to write a poem about. I did have some ideas along the line of overlaying the words so they were cross-hatched, but struggled with how to do this. Cos I don’t know what to do. My head and I’m feeling blue. Cos it’s really hard to write. In the way I’d hoped it might. There. A poem about cross-hatching. But then, a little miracle happened. 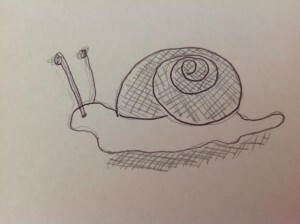 So, back at home, I had a go at drawing a snail, trying to remember how Gabriel did it. When that failed, I found an online tutorial for how to draw a snail: here. It took a few goes, but I drew a recognisable snail. Then for the cross-hatching. I had thought I would just cross hatch part of the shell – which is kind of the point of cross-hatching – to create shadow and contrast. But I found that it didn’t really work that way, plus cross-hatching is fun – so I did the whole shell. And, for the shadow effect, decided more cross-hatching was needed. Not planning on giving up my day-job any time soon, but am a bit proud of myself for trying something new. So blessed to live in such a beautiful part of the world.